28 SURFACEPREP 2015 COATINGSPROMAG.COM Roof Surface Prep It c a n be c h a l leng i ng to f i nd a s ystem t h at h a s t he abi l it y to st a nd up to pond i ng water a nd a m a nu fac t u rer t h at w i l l st a nd beh i nd t he s ystem w it h t hei r wa r ra nt y. You shou ld consider a solvent- bor ne s ystem, suc h a s c hem ist r ies combi n i ng u ret h a ne a nd si l icone, to help w it h pond i ng. T h at m ay g ive you t he st reng t h a nd du rabi l it y a s wel l a s t he u lt rav iolet ( U V ) st abi l it y t h at you need i n you r roof i ng s ystem. • Mag ic in a bucket! T here is no such thing when it comes to choosing the r ight coating system. Do not be lured in by some high-pr iced, equipment-dr iven f luid-applied coating system. W hi le what you see may be a g reat system, it is only as good as the crew insta l ling it. You may ex per ience g reater success by using moisture-cured products and inex pensive insta l lation equipment if you put for th the time and the ef for t needed to insta l l your system of choice properly. • A reas around penetrations, curbs, and f lashings. T hese areas need to be detai led, either w ith fabr ic and coating or w ith a f lashing-g rade product. It is my ex per ience that the f lashing-g rade products avai lable today do just as good a job as three coursing , and they are easier to insta l l and save time. If you are a relatively new contractor insta l ling coating systems, then I wou ld a lways recommend the latter. W hile there are conditions that will only allow for repair with fabrics, fabrics can make for a messy project when you are not used to installing them and, in fact, can cause more leaks than they prevent when installed improperly. With the adhesion properties of today's urethanes, most of the detail work can be done with a fashing-grade product. • Seams. Seams need an extra 60 mils (1,524 microns) average thickness of coating on a three-course system to ensure they stay closed for the next 10, 12, or even 15 years. We have had great success using a cart modified to lay a ribbon of flashing-grade out on the seam. The coating is then back-rolled. Our installers are seeing 300+ feet (91+ m) of coating installed per hour. It still needs to be back-rolled, but you can't beat that kind of productivity. Once the overall details of the roof are considered, it's time to move on to the specifcs. Metal Roofs So fa r, I have foc used on f l at or low-sloped, mod if ied, bu i lt-up roof (BUR), a nd sing le -ply appl icat ions. 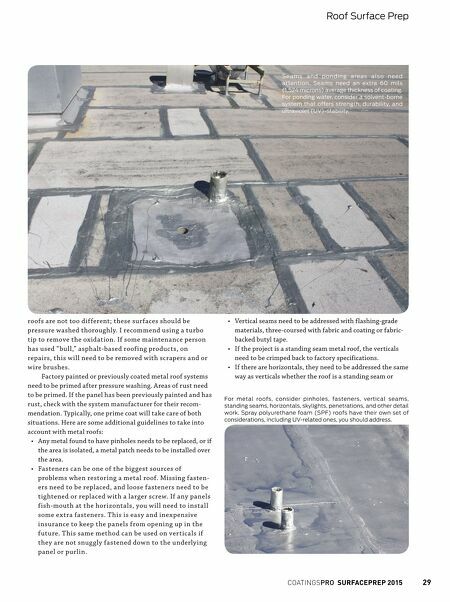 Meta l To determine whether you can put a new coating system on the roof, you'll need to make sure that it is dry. Is this a recoating or reroofing job? Surface prep should include repairing any end-laps or seams and removing any materials that can get in the way. Drain lines to an old air conditioning (A/C) unit might need to be removed, for example. 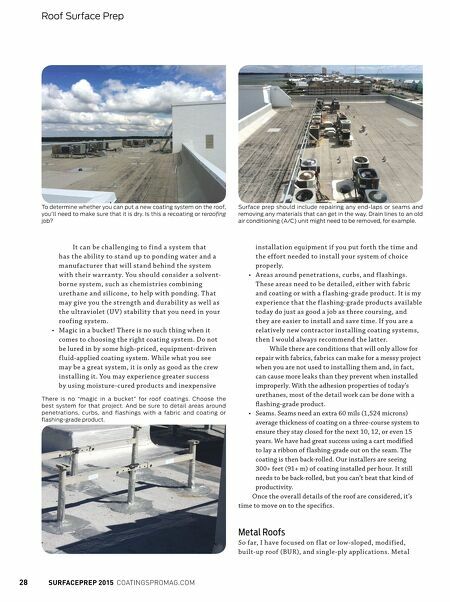 There is no "magic in a bucket" for roof coatings. Choose the best system for that project. And be sure to detail areas around penetrations, curbs, and flashings with a fabric and coating or flashing-grade product.